Brick Town Talk: Brickston Borough - LEGO Town, Architecture, Building Tips, Inspiration Ideas, and more! 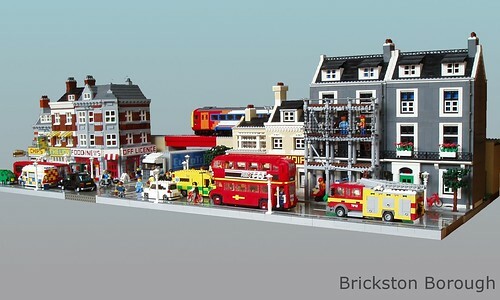 Mad physicist does it again with this amazing rendition of a small London street scene, the Brickston Borough. I for one am very fond of that elevated railway erected behind the buildings, a detail usually overlooked among LEGO town builders. It adds that cramped and busy environment usually associated with cities, making it all the more realistic. I hope to see more CC buildings in the months to come from this great builder. Enjoy! very good, feels very "authentic"
I would appreciate if a staff member here at bricktowntalk.blogspot.com could post it.